A simple and fresh dish; cheap and fast with no dexterity needed. You could set it all up before going to work – shove it in the ‘fridge, and pop it in the oven on getting home. 45 minutes later – you have a great meal. 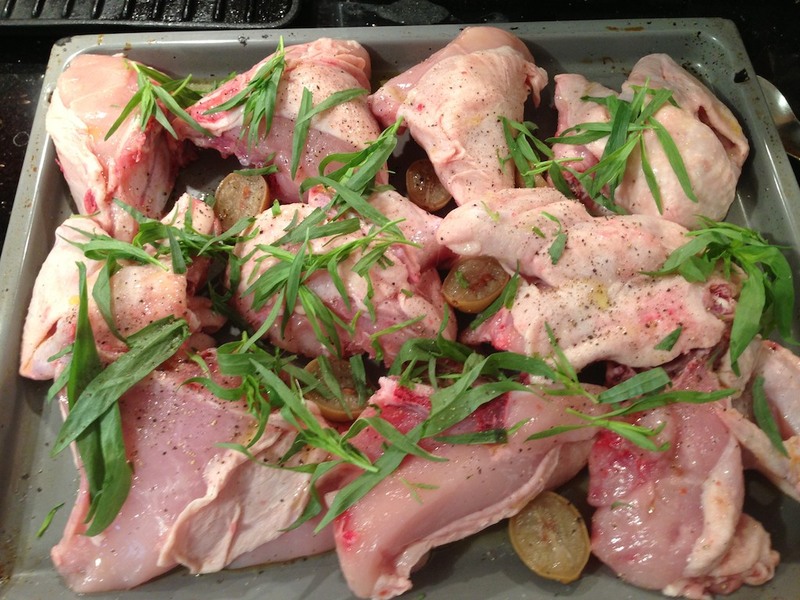 • If you have a butcher – ask them to let you have on the bone pieces of chicken – a mix of breast, thigh etc. is good. • A good bunch of fresh tarragon – but if only dried is available it isn’t the end of the world. • Lemons: now halved, preserved lemons are best, but otherwise fresh lemons halved is ok.
Shove the chicken pieces on a good baking or roasting tray and slosh in olive oil, coating the pieces; season with salt and pepper and tear most of the fresh tarragon all over the chicken. Cut the preserved lemons in half and dot them between the chicken pieces. Pre heat an oven to 180C and when hot – pop the whole lot in and cook for about 45 minutes; check all is cooked through (the chicken should not be pink at all and it you pierce a bit, juices should run clear). When it’s all cooked, brown and smelling, take the chicken out of the tin and keep warm perhaps in a warmed serving bowl or dish. Meantime deglaze the pan with a glass of white wine by pouring the wine in, popping it on the stove and using a wooden spoon, scape the cooking juices and bits into the now bubbling wine. Then pour over the chicken and add the remaining fresh tarragon. The key with the herb is to not go lightly with it! I’m making this tomorrow night – thanks J!